The minds behind The Expendables series are keen to start work on the next sequel. 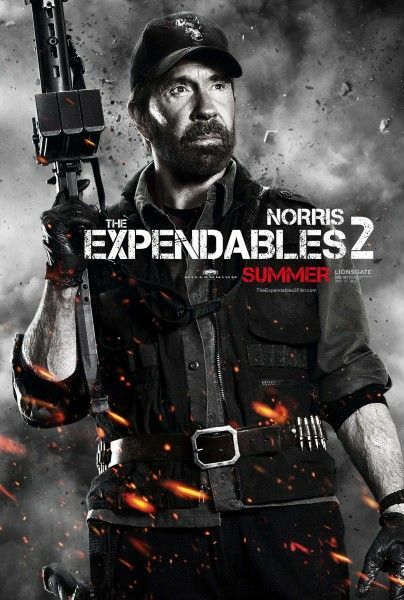 But as they busy themselves with adding more replaceable cogs to their wholly replaceable cast, today comes news that if/when The Expendables 3 does get rolling, current cog Chuck Norris won’t be there. The reason for his departure is unconfirmed; however, Norris did make headlines a few months ago when he unsuccessfully lobbied to have The Expendables 2 edited down to a PG-13 (lest his legion of young fans be traumatized by profanity while they’re watching old men murder people). The uninformed might also attribute the decision to Norris being in his 70s, not realizing that in Chuck Norris-years, he’s only 26. At any rate, hit the jump for the action legend’s comments on his departure from the franchise. As we previously reported, Sylvester Stallone and producer Avi Lerner are setting their sights on icons like Clint Eastwood and Harrison Ford to join Nicolas Cage to fill the Norris-shaped void in the third installment. But will it be enough? If any other Expendable were to leave The Expendables ensemble, it wouldn’t be a big deal. They’re all pretty much expendable. But Chuck Norris isn’t expendable, to that franchise or the earth itself. Were he ever to die, the cat-like aliens held at bay by the giant fist behind his beard would pounce on our planet like a giant ball of yarn, which would be the least of our worries since the atmosphere will have already been obliterated by the six dozen 50-megaton blasts it took to destroy him…or so an internet meme will soon posit.